A Southern Maine antiques road trip in the fall; the foliage is glorious, and the smell of the freshly fallen leaves is strong under your feet as you approach the shop's front door with hopes of a great find. Behind every door is a mystery – what if you just happened to stumble across that incredibly rare piece you've been searching for for years?? I love antique jewelry, and both my engagement ring and my wedding ring were those kind of surprise finds, one from an estate jewelry shop in Massachusetts and the other from an antique shop in Wells, Maine. It's been over 20 years, but I still remember the thrill of finding my cherished, one-of-a-kind pieces while hunting through those stores. 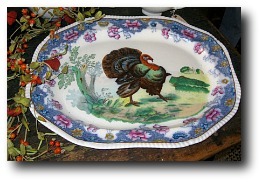 One of these days, for example, someone is going to walk through the door of Columbary House antiques in Cape Neddick, as I did, and see the rare Copeland Spode china turkey platter pictured below. I thought it was very lovely, but for a Spode collector, this one is going to make their day, their week, or possibly their year! Rumor has it that this straight shot of Southern Maine antiques on Route 1 is the original “Antiques Alley” of America, and you certainly won't find many better places for exploring antiques in Maine than this stretch of road that goes through York, Ogunquit, Wells and Kennebunk. There must be at least 100 Maine antiques shops on or near Route 1 in just those four towns. Some of these stores carry everything and anything, and some specialize in things like Victorian lighting, antique quilts, old house parts, or fine period furniture. There are exquisite tiny places, large multi-group shops, antiques malls and everything in between. 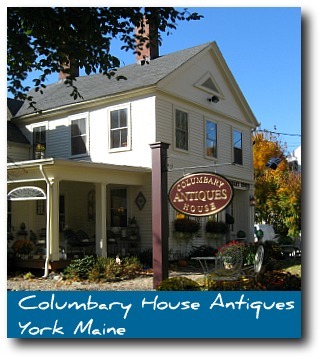 If you love antiques in Maine, particularly southern Maine, it's about a half hour drive on Route 1 north from York to Kennebunk if you don't stop for antiques, but it's bound to take two weeks or more if you visit each shop! Check our Event Calendar for more great vacation ideas! The Old York Antiques Show will take place at the museum's main campus, located at 3 Lindsay Road in York Village and runs Saturday, July 21 from 10 a.m. to 5 p.m. and Sunday, July 22, from 10 a.m. to 5 p.m. The $9 admission ($5 members) includes a $5 off coupon for admission to our 23rd Annual Decorator Show House at Harmon House in York Harbor as well as a discounted admission price of $5 to visit all of the museums’ buildings. Free parking is available on-site. For info on location, hours: www.oldyork.org. Are you or your hubby a fan of antique farm tractors and love to venture out to antique farm tractor shows? Venture on over to Eliot, Maine in late July, when the corn is gettin' high! The last weekend in July (July 27-29, 2012) brings you the 17th Annual Eliot Antique Tractor Show at the beautiful Raitt Homestead Farm Museum. Featuring a huge assortment of antique farm tractors, antique garden tractors, antique farm equipment displays, hit & miss engines, shingle mill demonstrations, auction, live music, bean hole beans, strawberry shortcake and other fair food, crafts, flea market, tractor parades, Garden Tractor Pulling, Antique Stone Boat Pulling, Transfer Sled pulling, kids pedal tractor pulls, the Raitt farm barrel tractors, Colonial Encampment and more. 100% of the proceeds raised go to the preservation and restoration of the beautiful 33 acre farm property and to continue its mission statement of educating future generations about farming history. $5 per person admission, ages 6 and under are free. Raitt Homestead Farm Museum, State Road, Eliot ME 03903. FMI: www.eliotantiquetractorandengine.org or 1-207-748-3303.